I have this set of furniture. I not sure they are Zitan wood or not. Can some body tell me how to identify Zitan wood. Easiest way might be to post a photo of the piece of furniture and one CLEAR close up of the grain of the wood and let some experienced members comment. Depending on age and quality, zitan is a dense wood with a braided/twisted grain, often with gold highlights (threads). Zitan is dense and does not float in water, but I do not suggest that you try floating the piece in water to find out if it sinks. Zitan excretes a resin that turns black. Zitan that has not been polished for a long time will accumulate the black resin to the point that it appears like black lacquer. If you take a cotton ball with some denatured alcohol and rub the wood, the resin in the wood will turn the cotton RED. Zitan was long used to create red & purple dye. If you're going to try the cotton/alcohol, do so on an area that is not in plain view (underside of the piece will suffice). Yes, zitan is a die wood, but they all - the Dalbergia; Pterocarpus; & Ormoisa genera hardwoods have strong tannins. huali wood also turns a cloth deep purple if you rub it with meths. Beijing agricultural identified a group of 32 species that all variously have these properties and were used in the production of Chinese furniture during the Ming & Qing dynasties. No, this is not the unambiguous test you can do to ascertain Zitan or not. There is only one species among the 32 that leech red die with alcohol that should be called Zitan. Pterocarpus santalinus. It is among other things also an incense wood, so again even the "odorifera" paradigm (vs/ve: Shixiang / Huali wood) requires serious reflection. There is however truth to the concept that zitan is the densest of the hardwoods, but interestingly despite being so is by far the easiest of the hardwoods to work. It cuts is a very specific manner; and tears against the grain also very specifically. This is by way and far above the least unambiguous way of telling whether the wood is P. santalinus or one of the generics, like Dalbergia melanoxlon or Pterocarpus soyauxii. Neither of these generics are as easy to work as the king of the hardwoods, and consequently the ethos of the cabinetmaker becomes marred through having to work with tools that do not keep a sharp edge... not for long at any rate. Zitan is therefore always far more refined; whereas the generics unanimously do not retain purity of form. You can actually see it from a mile off, which is why ones instinct is so often surprisingly accurate. Anyhow, yes, the best thing to do is post a few shots of the piece itself. If there is a loose splinter underneath the piece (without doing any deliberate damage) place that in a glass of water. If it's specific gravity is higher than 1:00 it will sink no matter how small it is (but be sure to shake off any bubbles) If it sinks, there is a possibility it is zitan, but again this is not the unambiguous zitan test. Hongmu also sinks. So does huali, and many other sp, but you will then at least know it's one of the hardwoods. Please email us a picture and what you know about the piece in order to obtain an accurate valuation. 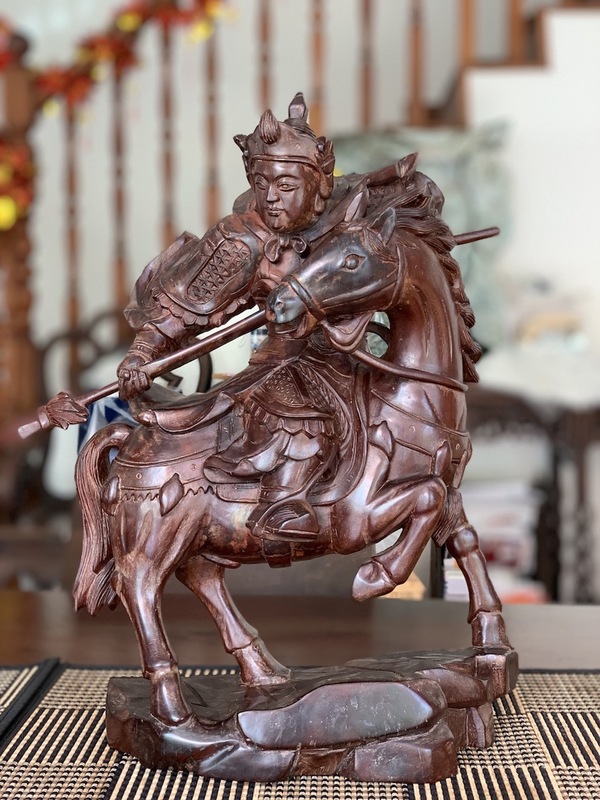 We have substantial expertise in authenticating and valuing Chinese Antique Furniture constructed of rare hardwoods including Zitan and Huanghuali. Please include in your email any provenance detail if available (previous owners and dates). I acquired form a prominent estate. Carved from one tree trunk. 4 ft tall. eyes appear to be glass and teeth are animal teeth. Very detailed. Seller did not know what kind of wood. Although appearing black, in bright sunlight is has a purple hue. Very, very heavy.Said to be Chinese. Some say Zitan others say too big to be Zitan. Your thoughts? Pictures attached...What do you think?